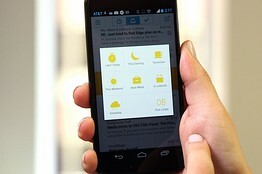 WSJ: Best Mobile Apps for Managing Your Email. The first thing I want from an email app is a smarter “New Message” experience. I yearn to attach files, include my calendar availability, even check my inbox while working on a draft message—without jumping to different folders and apps. Here’s an unsolved mystery: Why doesn’t the iPhone email app have a file attachment button? Even apps like Mailbox, CloudMagic, Evomail and MyMail (which are available on Android) have simple attachment tools. The Acompli iPhone app goes even further. The second thing I want is to be able to easily file emails and then get back to them when I actually have time to respond. CloudMagic also trumps the others at email search. Type in a term at the top of the inbox and it quickly searches the full text of all your messages from the beginning of time. Anyone who has ever been frustrated by the iPhone’s slow and clumsy email search can appreciate that. Other new apps concentrate on making it easier to find not text but photos and attachments. An app called Gusto, which for now only works with Gmail on the iPhone, creates a tab for each kind of attachment. You sift through all the photos people have sent you on one page, and documents and PDFs on another. Acompli offers the same functionality. ← WSJ: Cloud Atlas: The Smartest Ways to Store Digital Photos.